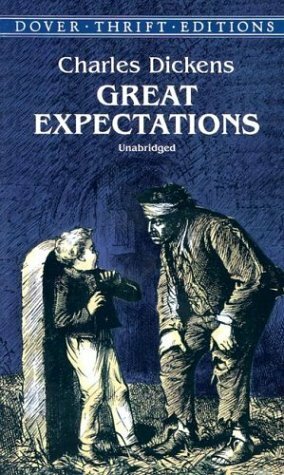 Illness for the past few days induced me to finish reading Great Expectations by Charles Dickens - and if you'll excuse the pun, it wasn't entirely what I was expecting. One way in which it did agree with my expectations was in Dickens' marvellous way of painting grotesque portraits of characters with words - the bad, the mundane, the evil, the misguided, and the murderous characters are always the most interesting in Dickens' world, and the way in which he describes them turns them almost into caricatures - except that you wouldn't laugh. There are faults aplenty in this book, as there are in Dickens' other novels - Mrs Joe is mean and vicious, with an unpredictable temper, an easy hand for violence, and a self-delusion in her conviction that she has done a good job in bringing Pip up "by hand" as is often mentioned. Mr Pumblechook has a striking resemblance to Oliver Twist's Mr Bumble - puffed up with self-importance and greed, ever using both the fortunes and misfortunes of others for his own bloated reputation. Pip himself, the main character is certainly not without fault (throughout the whole book I was inwardly decrying his arrogance and stupidity) - he also deludes himself - in fact, many of the characters' faults span from self-delusion, and from deciet, and from misunderstanding. Pip deludes himself from a young age in expecting his fortune to be made by others - mainly Miss Havisham, when he would have had a much happier life if he had been more pro-active - making things happen instead of allowing things to happen to him. He becomes arrogant and ignorant in the midst of his "Great Expectations", and becomes more and more passive - taking more of a back seat in his own life. He fails to recognise that he is only ever close to happy when he is securing his own fortunes, instead of having them bestowed upon him. The main theme of the book I think illustrates Dickens' belief that money cannot make us happy, - only those who are satisfied with their station in life as it is can be truely happy, as is shown by the only two sensible characters in the whole book (Joe and Biddy) marrying each other and living a happy life together. Although the ending at first glance was unsatisfying in my eyes - leaving it relatively open - Pip and Estella could have gone off and married each other, or they could have separated and never seen each other again - which it is is not specified. However further reading revealed to me that Dickens was originally forced by his publisher to change the original ending - where Pip meets Estella again and she is now married to a Doctor, and they part ways forever - he remaining a bachelor forever. I can kind of see Dickens' meaning here - after all his struggles, and after finally putting right all the wrongs that came of his Great Expectations, would it be right for Pip to finally marry the girl who first caused him to be unsatisfied with himself and with Joe and Biddy? So although in a traditional sense the book doesn't have a "happy ending" because the main protagonist didn't have one, but there were happy endings for those who deserved them - Wemmick rewarded for his diligent care of the Aged P. through his marriage to his exact match - Herbert taking himself away from the stupidity and expectations of his mother by marrying a girl he loved instead of someone with a title, and earning his own keep through the help of Pip. And here of course, Dickens subtly rewards Pip for his one good deed - Pip helps Herbert into his business whilst he still has his Expectations, and Herbert is then able to help Pip when all goes pear-shaped - unaware until later that in a way Pip helped himself! So although the ending was unsatisfying - it was believable - sometimes the storyteller tells us that we need not make a happy ending - just make an ending. The story had a few elements of archetypes found in folklore and fairytale in it - mainly the idea that our wishes coming true isn't neccessarily a good thing, and it is only when those wishes are once again given up, and the damage caused by them healed, that our hero can be tolerably happy. Well worth a read if you haven't already! Nice overview. Main theme - things are not what they seem. Second theme - Your dreams may not be what will make you happy. Third theme - everyone has 'great expectations' but their own emotions, prejudices, trivial events or inactivity cause them to just miss true happiness - the real tragedy of human life. Interesting thoughts. I agree that the main theme is that proactive actions are the route to achievement, and that perhaps Pip fails in his "Great Expectations" because he allows himself to be swept along by the current of life, rather than grabbing an oar. But I would also say that Dicken's is emphasising the importance of flexibility in life choices. Bending and adapting like a willow in a storm is often the best route to happiness. For example, characters like Joe and Biddy, who adapt to their circumstances, live contented lives, while Miss Havisham, whose life has not gone according to her plans, lives a life of unhappy solitude and misdirected malice. Schopenhauer said that all motivation is based on desire, and that this desire is futile because the completion of goals does not produce contentment, but a feeling of boredom and a desire to strive for new goals. This struggle for contentment and satisfaction is what drives all people, and will ultimately remain unfulfilled. This is pretty much the most depressing philosophy ever concluded, but I choose to believe that the completion of goals themselves is not as important as the journey to achieve them. It is the means, rather than the end, that is worth savouring. And in that sense, it could be concluded that Pip has had a very fulfilling life, although he has not ended up where his "Great Expectations" had intended.